The Sisters of the Holy Names are celebrating 150 years of ministry in California in 2018. In that time, they have gone from a band of six courageous young Sisters to a community that founded schools throughout the Bay Area and Southern California, including many that have been recognized with exemplary school status. Their 150th Anniversary serves as a celebration of the Sisters and the recognition of the significant role they have played in the communities they have served for so many decades. It is also a call to action for members of the greater Northern and Southern California community, including former students and staff, their families, women and men religious, Sisters’ families and others to support initiatives central to the SNJM mission, including an end to human trafficking, justice for immigrants and refugees, and the universal right to clean and safe water. For information about scheduled 150th anniversary events, please see our Events page. In response to an urgent appeal from Archbishop Joseph Alemany, six young Sisters left their homes in Canada to begin a strong tradition of ministry in California. After a strenuous journey by ship and train, they arrived in San Francisco on May 10, 1868. To their astonishment, the Sisters of Mercy who came to greet them served dishes of strawberries and cream – a treat that would be completely unheard-of so early in the year in Quebec. Every May 10 since then, the Sisters have celebrated Strawberry Day as the anniversary of their arrival in California. The Sisters established their first California convent and school on the shores of Oakland’s Lake Merritt. Within a few years, it became a hub from which Sisters went forth daily to teach in various Oakland parishes. As their numbers grew, the Sisters expanded their ministry to San Francisco, then to southern California. In the 1890s, Holy Names Sisters opened the first Catholic schools in Alhambra, Pasadena, Pomona and Santa Monica. The dioceses and parishes eventually assumed sponsorship of most of the schools, but one of the oldest – Ramona Convent Secondary School in Alhambra – remains an SNJM school, serving young women from the San Gabriel Valley. The convent at Lake Merritt in Oakland was the site of the first SNJM school in California as well as the California provincial house and novitiate until, in February 1952, they relocated to the new Convent in Los Gatos. By the turn of the century, the Sisters recognized the pressing need for a college to provide higher education for both religious and lay women. In 1908, they constructed a college building at the Lake Merritt site; by 1926, Holy Names College was a four-year institution of higher learning. In 1931, the Sisters opened Holy Names High School to offer Christian education for girls from several Oakland parishes. During the same period, the Sisters also responded generously to the period of growth and development of parish schools (both elementary and secondary) in the Archdioceses of Los Angeles and San Francisco. 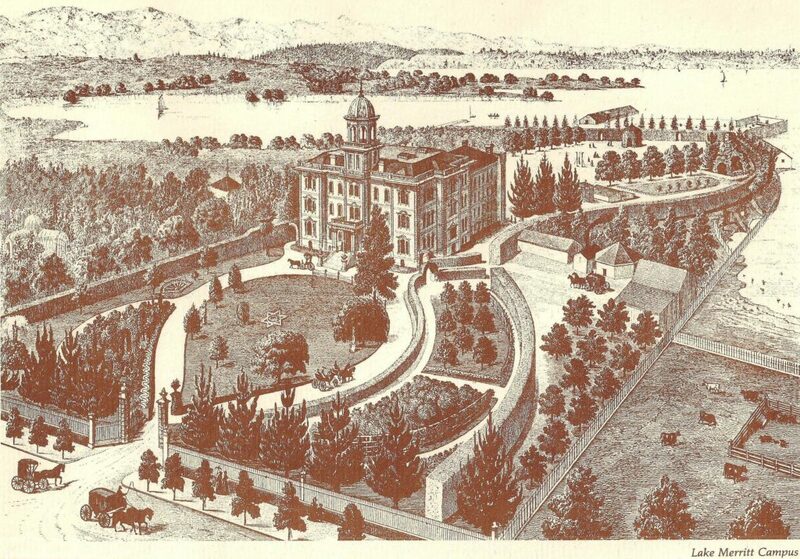 When Holy Names College outgrew the Lake Merritt location, the land was sold and the proceeds went to relocating the college to the site it occupies today on Mountain Boulevard overlooking the San Francisco Bay. Now known as Holy Names University, it attracts a diverse student body to its unique Weekend College and contemporary career-oriented degree programs. With the Lake Merritt site sold, it was time to find a new home for the Sisters’ provincial administration, novitiate and infirmary. To assist with fundraising for the new facility, a group of mothers of the Sisters established an auxiliary group called the Marie Rose Guild in 1950. With their help, the Sisters made a new start at the Convent of the Holy Names in Los Gatos in December 1951. The Guild added chapters elsewhere in California and continued fundraising to help care for infirm and retired Sisters. The Guilds in Los Gatos and Southern California are still active today. In 1961, the California Province responded to Pope John XXIII’s appeal for missionaries to Latin America by sending three Sisters to staff a mission in Arequipa, Peru. They were the first of many Sisters who came to operate a clinic and help staff and administer the elementary and high schools of Our Lady of Pilar Parish. Later, their missionary activities expanded to LaCurva near the Peruvian coast. Holy Names Sisters currently minister in San Juan de Lurigancha, one of the poorest areas of Lima. Around this time, the Sisters in California also established a retreat center after purchasing a former resort and retreat facility in Santa Cruz called Villa Maria del Mar. Thousands of people – including but not limited to priests and religious – have experienced the hospitality and ministry of the Sisters at this lovely and tranquil oceanside location. In 1970, a new education ministry took shape when the Sisters opened a Montessori pre-school in unoccupied space in the Novitiate building of the Los Gatos Convent. During the next 29 years, Casa Maria Montessori grew from 26 students to 166. It finally closed amid increasing preschool regulation and the need to expand the convent’s space for aging Sisters. As laity became more involved in running Catholic schools and religious education programs, some Sisters began to focus on the more pastoral aspects of parish life, serving as directors of religious education, liturgy coordinators, parish administrators, community organizers, Eucharistic ministers to the sick, visitors to the elderly and ill, and coordinators and staff of parish centers. Others engaged in direct services to the poor, both in California and in other parts of the world with the greatest needs. In 2014, after careful discernment, the Sisters sold the land housing the Los Gatos Convent, returning it to its original residential use. The retired and infirm Sisters transitioned to new settings – those needing skilled care and assisted living joined the lay residents at Our Lady of Fatima Villa, sponsored by the Kenosha Dominican Sisters, and others moved into the newly built Merrill Gardens Retirement Community in Campbell. In each of location, they established local communities of Sisters to ensure pastoral and community support from other Holy Names Sisters. What others might call “coincidence,” the Sisters have experienced as miracles. In the midst of preparations for the Sisters’ move to Merrill Gardens, clergy at Holy Spirit Episcopal Church next to the retirement center offered to let them use the building for prayer. Then, in a surprising acts of God’s Providence, the Sisters learned that the church property would become available due to a merger of congregations in the Episcopal diocese. A purchase was soon arranged that provided a worship space for the Sisters – named Holy Spirit Chapel in honor of the previous congregation – as well as office space and a guest center. The need for services in ministry is as great as ever. The Sisters of the Holy Names continue to strive, with the financial assistance of our benefactors and the collaboration of dedicated laity, to respond to the needs of our Church and the changing world, serving those who are most in need.